• Body engineered design. • Zippered reflective pocket on the back. • Comfortable flatlock seam technology on all seams. • Integrated thumbholes. Superlight Carbon SLEEVELESS BASE LAYER (SLP1). They are designed to be worn beneath cycling jerseys and jackets. The Superlight Carbon Short Sleeve Base Layer (CLP2) has an unique blend of Dryarn (75%), Resistex Carbon (15%) and Elastane (10%). Sleeve Length: Long Sleeve. Size: Small. Color: Black. 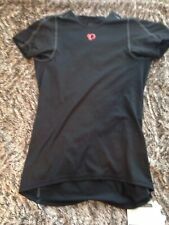 SANTINI 365 LADIES TANK TOP BASE LAYER FOR CYCLING AND RUNNING - REDUCED!! Specifically designed to keep you feeling cool and dry in warm conditions this is an ideal base layer for high intensity training/racing during warmer months. Seamless mesh base layer top Transfers moisture quickly away from skin Soft material feel Lightweight garment Works well in warm and cold conditions under a jersey 2 different mesh patterns allows better ventilation Keeps you dry and maintains body temperature 66% polypropylene 24% polyamide, 10% Elastane . From Rapha The construction and fabric of the Pro Team Base Layer is exactly as used by Team Sky, with flatlock stitching to prevent discomfort and chafing and high-stretch side panels to allow for a close fit. Outwet make a one size fits all base layer using Dryarn. This is a 90% Polyproplene and 10% Elastane fabric blend. Dryarn has several unique properties that make it a good choice for performance cycling apparel . Model: Endurance Compression S/S Top. everything from bicycles and snowboards to jerseys and jackets. hassle free. Good Luck and CRANK ON! Model: Base Compression L/S Top. Features: 2 Back Pockets, 1/4 Zip. Superlight SLEEVELESS BASE LAYER (SLP1). They are designed to be worn beneath cycling jerseys and jackets. The Superlight Short Sleeve Base Layer (SLP2) has an unique blend of Dryarn (90%) and Elastane (10%). The base layers are close-fitting and cut long at the back for a better fit on the bike. Designed to be worn under your jersey or as a close-fitting t-shirt on rides in cool to cold weather. • Hand wash or gentle machine wash 40C. You can ’t go wrong with Pearl iZUMi cycling apparel. Pearl iZUMi W Transfer Cyc ss Base, White, X-Small. Before there was PEARL iZUMi, there was a man and a bike. The year: 1950. And in fourteen short years, he’d go form lugging clothing on a bike to redefining what every cyclist wore on them. New Endura Base Layer. Our marriage began with cycling, our favorite is traveling the best way possible by bike of course. We love finding good deals on products but our favorite part is passing the bargains on to you! This is a Gore Short Sleeve Base Layer. Thin and soft fabric. High-stretch material enables close fit with maximum comfort. Arm Length - 29.5". Extra-long back. Waist - 30.25 to 31.5. The SIXS mesh sleeveless jersey is the product for those who need minimal, fresh and lightweight clothing. Thanks to GRID-TECH technology, the mesh lies between the skin and the clothing on top to prevent annoying chafing and create cushions of fresh air that reduce the sensation of the skin "suffocating" under the garment. The polyamide fiber with its extremely low specific weight is able to absorb the skin's moisture to leave it fresh and dry. Madison Cycling MTB Isoler Womens Base Layer- Size 8/10 -White-CLEARANCE! For years riders racing in the mountains have stuffed newspapers down the front of their jerseys at the summit of climbs in order to conserve body heat on the descent. • Bonded seams at the shoulders and yoke.